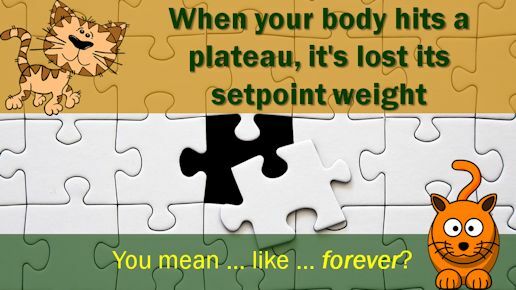 You can remind your body of its natural "set point" - and choose what weight that is! It's not about willpower; it's not about depriving yourself - and it's definitely not about calorie counting! How do you experience weight loss? Anxiety? Deprivation? Hunger? No fun at all? 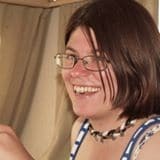 Yoyo dieting - the kind of weight loss that involves taking off a lot of weight ... and then putting it all back on again (and more!) is no fun. You feel hungry, anxious, obsessive about calorie counting, deprived of your favourite food and all round general miserable. What if I told you it doesn't have to be that way? What if I told you that your body is just confused? That it's forgotten what its natural weight is: the weight and shape your body (and you!) feels most comfortable with. What if all this time, your body has been trying to tell you something important: that you're a good person, that you're worthy of love ... and that you deserve to look and feel beautiful? Impossible dream, right? Nope. Not even a little. When your body is at its natural healthy weight, it's in proportion, it looks good in clothes, feels great in any weather ... and gets the kind of greeting I got recently from a friend I hadn't seen for a while: "Well, hello, Skinny Minny!" That particular friend is always on a diet. However, about a week after my visit, she texted me, saying: I've been doing what you told me ... and I seem to have lost 5 pounds!!! It doesn't feel like dieting - it feels like normal, every day eating. Cravings: The Body's Way Of Telling You That You Deserve A Reward For Being So Strong! Cravings. We all have them. And in the end, we all, without exception, "give in" to them. And then we beat ourselves up for being "weak". But think about it. Every celebration all our lives is marked with food: weddings, births, Christmas, Easter, Thanksgiving ... and even funerals are followed by a Wake. With food. When was the last time you went to a wedding reception where the only food served was celery sticks? The truth is that when you've made all that effort and lost all that weight, your body is telling you that you deserve a reward. And what's the most popular reward for any achievement? A meal out; a box of chocolates; a big cake - I mean, we all celebrate with a big cake just for surviving another year! I Love A Good "Before" and "After" Photo, Don't You? Below is my "Before" and "After" photo shoot. The "before" was taken at a lovely family gathering for a - you guessed it! - meal out. The "After" was at a lovely visit with a friend - her mirror was just right for taking selfies! I really loved that dress. Why?! Wow! What a difference! Skinny Minny, indeed! Your body forgot its natural setpoint weight. There really is a range of body weight that's right for your body height and build. You can remind your body of what's right for it. Cravings are your body's way of rewarding you for being strong. Cravings are your subconscious' way of telling you it's time for a reward. You can reprogram your subconscious to reward you with something a bit more healthy, but just as enjoyable - or more so! Resistance to leaving your comfort zone. We all have our own comfort zones, which, when it comes to weight loss, are not very comfortable at all. In fact, it can seem more like a prison than a comfort zone. You can release the constraints that keep you in that very uncomfortable comfort zone. Did you notice we've not talked about exercise or calories? That's because successful dieting isn't about calories or exercise. It's true. Effortless Weight Loss is more concerned with overcoming your body's forgetfulness, cravings, resistance to moving out of that "comfort" zone ... and giving your body more nourishment than its ever had before. Take another look at that "before" and "after" selfie shoot above. That transformation was a side effect of a completely different issue I was dealing with. I didn't mean to lose weight - it just happened. And it was as much a surprise to me as to anyone. Weight loss without trying! Effortless! I Still Eat Cake - And Chocolate! That's right - I still eat cake. And chocolate. Not the same kind I used to eat - if anything, these versions are more calories! And no, I'm not turning into a rabbit. I still eat roast dinners. In fact, that friend who lost 5 pounds after I went home? She was appalled at first at the amount of food I eat. 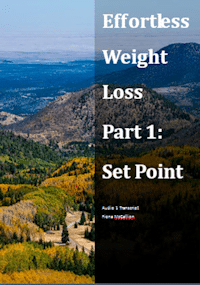 How Can You Achieve Your Natural Setpoint Weight And Stay There? 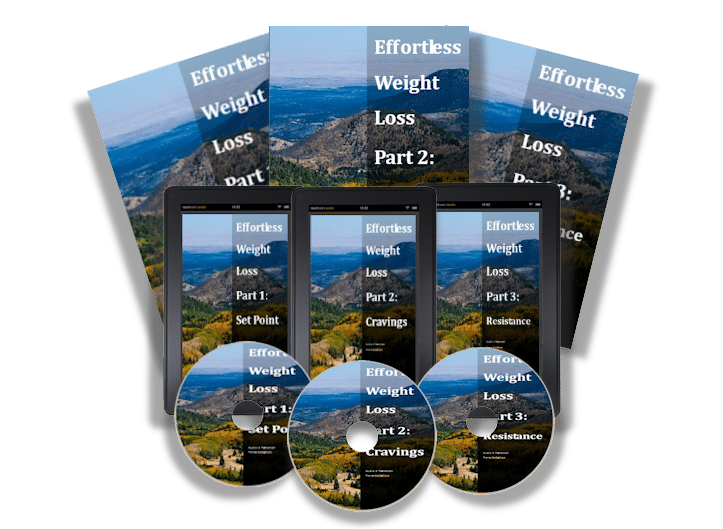 Effortless Weight Loss is a three part audio course that lets you reproduce my weight loss transformation. Using these easy, cutting edge processes, you can achieve your natural weight without really trying and be greeted by your friends with "hello, skinny minny - you look really well!" This course is like a session with me, taking you step by step through what you need to do: no powders, no potions, just proven techniques and scientifically backed additions and subtractions from what you normally eat. Part 1: Find your natural set point weight and tap it into your system with EFT (Emotional Freedom Techniques). Overcome any resistance to the idea that you can do it. Part 2: Deal with cravings permanently. Let your subconscious know that you've got the message its communicating and reprogram it to ask for enjoyable pastimes that don't involve eating! Part 3: Add probiotics for good digestion, change your diet to Paleo, and overcome all resistance to making the changes that result in your transformation. Explore recipes for Brownies. Eat many of them. MP3 listen anywhere Audios, plus PDF Transcripts and Workbooks included for each part of the course to keep you on track. You don't have to suffer hunger, deprivation or failure ever again. Download this course, which includes the audios, transcripts and workbooks to choose your own natural weight set point, make cravings disappear and release resistance permanently. 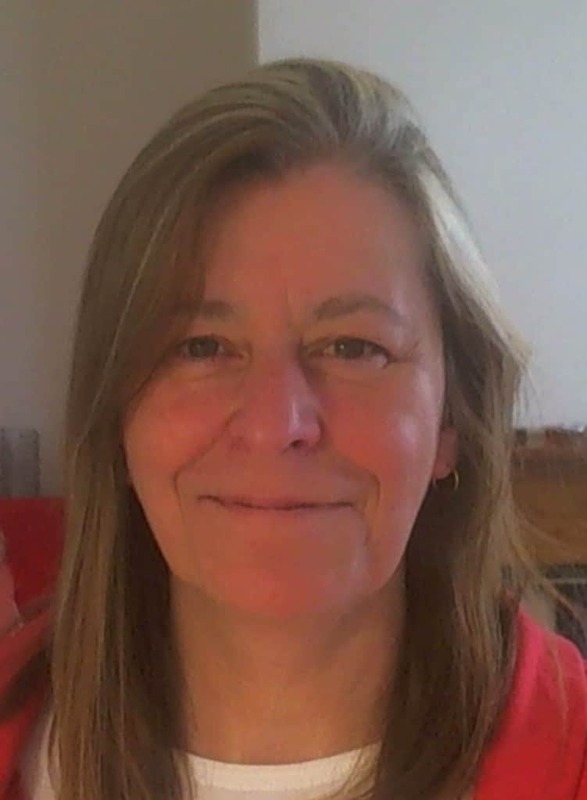 Fiona is a Health and Personal Development Coach of 20 years, with a ton of certificates and experience ... and loves people. Particularly people with challenging health issues or stressful life transitions they need to rise above and put into perspective. Her five step process addresses: nutrition, lifestyle, mindset, stress management and ​gentle movement. In today's fast paced world, many areas of life are affected in difficult times and it's important to support the whole person, not just the part that's hurting physically or emotionally. Do you know what's going to happen if you think about this program until after whatever your "reason" is? Except that there will be a few extra pounds to shift. And a whole lot of guilt and silent beating yourself up about those extra pounds. Starting now with Effortless Weight Loss means that you can still eat whatever you like. Cake. Brownies. Butter. And even mince pies, if you're that way inclined. You're In Charge. Even Over the Holidays. Imagine still being able to eat your fabulous holiday dinner - even when you're losing weight! All it requires is a small adjustment to your cooking oils and ingredients. All of which are available at your local store. Still eat bacon. Still eat roast veg. Still eat Christmas pudding. Found myself eating less too, for instance I went on holiday and had lots of meals out. It was the first time ever I haven't been able to clear my plate. I'm not going to tell you what to eat, except in general terms. We'll add some probiotics to get your digestion working properly again, do some tapping ... and eat whatever you like - as much as you like! - within the guidelines. But, if you're like me, you'll want to examine the pros and cons of investing in the Effortless Weight Loss Program. No feeling deprived of your favourite foods. No embarrassing loose skin - I have less loose skin now than before I started. Great skin and hair is a useful side effect! No weird potions or powders. Eat normally. You may find unexpected side effects, like feeling cheerful, compliments from your friends or feeling more healthy. How will you cope? You can eat brownies. Regularly. You actually have to take action to see results. It's not a magic bullet, meaning it's not instant. On the bright side, though, you won't suffer. You'll have to buy new clothes. Oh, no! Obsessive calorie counting is totally out of the window - how can I get the most out of these 10 calories left in my daily allowance? Nope. No more of that. There's no money back guarantee - when you've bought it you've bought it. The digital download nature of the course means you can't give it back for a refund without it still being in your possession, like you can with a book or physical product. EFT tapping - a tool you can use on pretty much anything! When you look after your microbiome - the good bacteria in your digestive system - your body starts working properly again and this can result in quite a bit of weight loss by itself. Add to that Paleo dietary guidelines and the weight pretty much just falls off. EFT for Weightloss is available all over the internet. What makes your product so special? I've looked very carefully at other EFT Tapping Weightloss products and not one of them uses the same process I do. Don't get me wrong - there are good weight loss products out there. Mostly they're based on the Body Positive model. This is great. 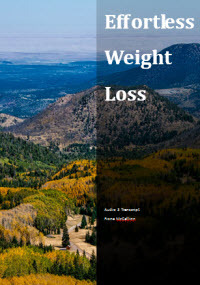 But Effortless Weight Loss is aimed at getting you started losing weight fast, effectively and directly at the source. Go to this contact page - I'll answer as quickly as possible, generally within 24 hours. You can weigh yourself as often as you like, but frankly, why would you? I don't even own a set of scales. Obsessive weighing several times a day is silly. It sets you up for disappointment and could hardly be described as "effortless". Stop doing it. If you absolutely must weigh yourself, then do so no more than once a week on the same day of the week at the same time. After breakfast and ... um ... bathroom break. Eugh! Why would anyone want to eat those? No. Is this program safe for diabetics? ​I'm a vegetarian. Is this program right for me? ​The probiotics and tapping won't affect your vegetarian lifestyle. Paleo eating does require a bit of adjustment for vegetarians - but the truth is, you're probably eating a lot of vegetables, tofu, nuts and seeds anyway. And you can add a lot of eggs and so on. You can do this with a little thought and planning. What is EFT Tapping? And how do I do it? There is a video explaining what EFT Tapping is and how to do it on the download page. ​Is this a diet? Will you tell me what to eat? ​This is not a diet plan. It's a method of reprogramming your body to eat less and more healthily. I do suggest a particular lifestyle change, but as the testimonial above indicates, it's not strictly necessary. Fiona was a delight to work with. She has a rare, innate ability to see the big picture and then break it down into small, manageable parts. 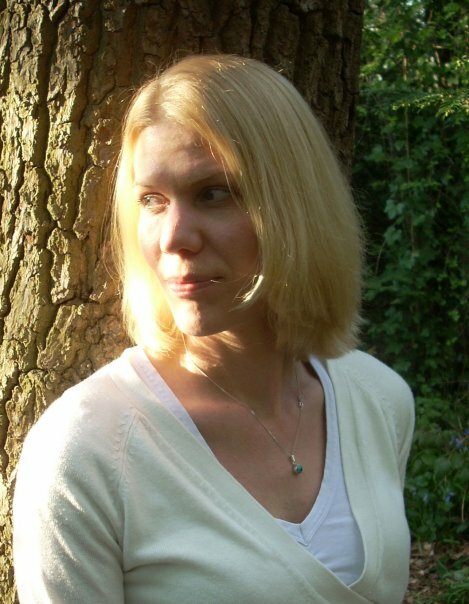 She is also brilliant at translating complex ideas into plain English.